Graphic & Web Designer, Illustrator, Photographer, Art Director. Creative Pro since 1980 B.C. - Before Computers! MAC's Captive Design Guy. A&E 2018, “Rhythm of the Night” by Arts Triumphant Dance Theatre. After catching our breaths over the winter, we had an opportunity to look back at Art & Elegance 2018. Attendance numbers were about the same as last year, and between guests and donations, we raised over $36,000 for MAC, which represented a slight uptick from 2017. Well done! We have gotten positive feedback from the event. Of course everyone wishes that Mary had the time to sing more songs. We did hear that the cheese table was not easy to find. We’re really sorry if you missed out, it was really trés magnifiqué! 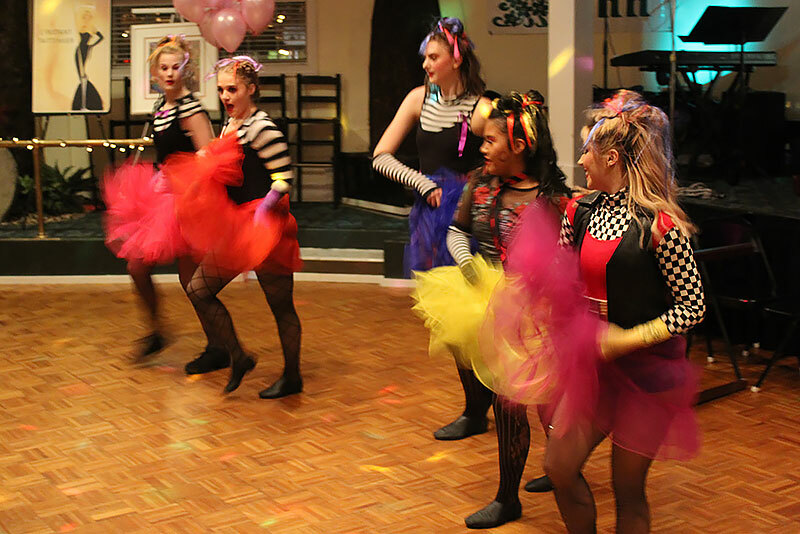 A highlight of the evening, in addition to the Jordan English Jazz Orchestra with Mary Hott, was the delightful Parisian Dance Revue “Rhythm of the Night” by Arts Triumphant Dance Theatre. C’est bon! Merci, mademoiselles. Our After Party where our sponsors and guests were able to celebrate with the Artists and the Committee was a lovely, relaxing evening as well. Thank you, each and every one of you! We could not have done it without your support. That thanks is of course extended to everyone involved, Morgan Arts Council and MAC staffers, volunteers, The Country Inn, and all our sponsors and the generous donations of our local business community. Un merci spécial à tous nos artistes et vendeurs contributeurs. – A special thank you to all our contributing artists and vendors. We hope to see each and every one of you at the 2019 event! It’s been a couple of weeks since Art & Elegance 2018 – and the night was tres magnifique! Now that the event has passed, and we’ve caught our breath, a little, and enjoyed a little downtime with our families for Thanksgiving, we can let you see this delightful and whimsical piece from our featured artist Jonathan Heath. The truly epic painting features a number of Berkeley Springs and Morgan county luminaries charmingly caricatured in Jonathan’s signature style. The piece was the featured item in the live auction at the height of the evening and fetched over $3,500 for MAC. C’est bien! We’re looking forward to seeing many of our artists, sponsors and patrons at the after-party on December 13th to raise a glass and celebrate another successful event! So just a little more planning and number crunching to do. Thank you so much to everyone who contributed, guests, artists, sponors, The Country Inn, patrons, performers, volunteers, the A&E Comitteee and of course, MAC. Each and very one of you makes this possible year over year. And the champange was yummy! Merci beaucoup à tous nos artistes et vendeurs contributeurs et nos invités! Art, Prizes, Decorations, & Supplies staging at The Country Inn. Three days out and we’re closing on on Art & Elegance 2018 – An Evening in Paris! – Une Soirée à Paris! 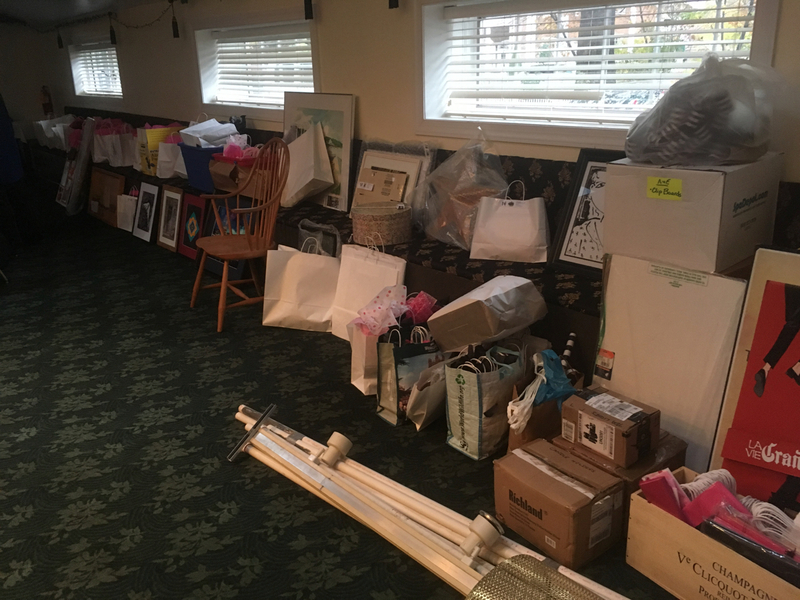 We transported art, prizes, decorations and supplies to The Country Inn in preparation for Saturday Night. There are 1001 details to finish off, but we’re ticking off our lists so all our guests can have an entertaining and fabulous evening – soirée amusante et fabuleuse! We also have our programs back from the Morgan Messenger’s Printing service and they are gorgeous. Todd and the staff there are straight up awesome. And we now have our Raffles, Silent Auction Items and Prizes posted here on the site. winners will be announced shortly after. 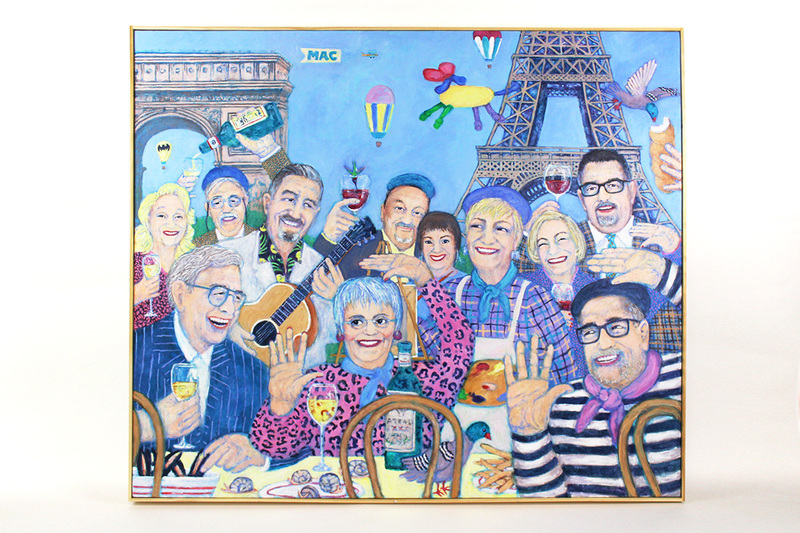 This year’s Live Auction will feature “A MAC Evening in Paris” – an original painting by local artist Jonathan Heath specifically commissioned by MAC to commemorate this year’s event. Bid vigorously to take home this one-of-a-kind keepsake! Take a look at our trio of Premier Raffle Items and purchase as many raffle tickets as you like from our volunteers for your chance to win one (or more) of these three outstanding Art & Experiences Raffle items. and give them to the attendant at the raffle table. 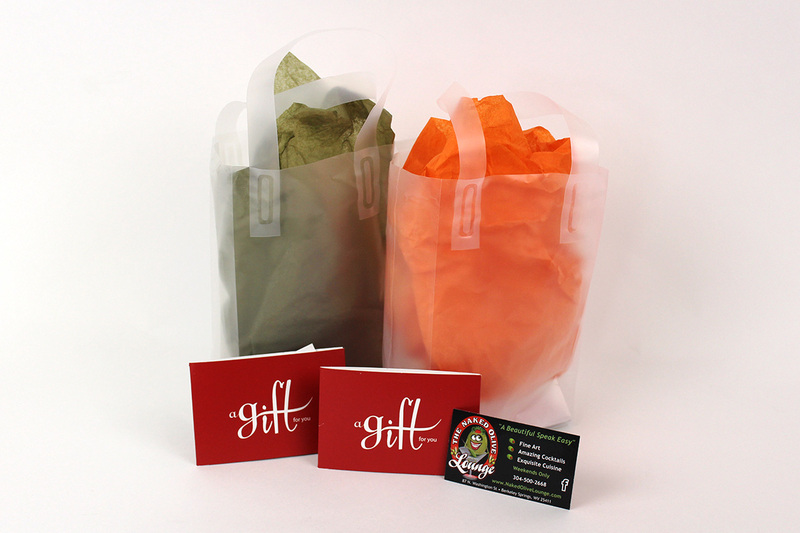 Buy a balloon ticket, pop a balloon, and collect the art or experience prize inside! Guaranteed value of $25 or greater. Tickets are $20 per balloon. 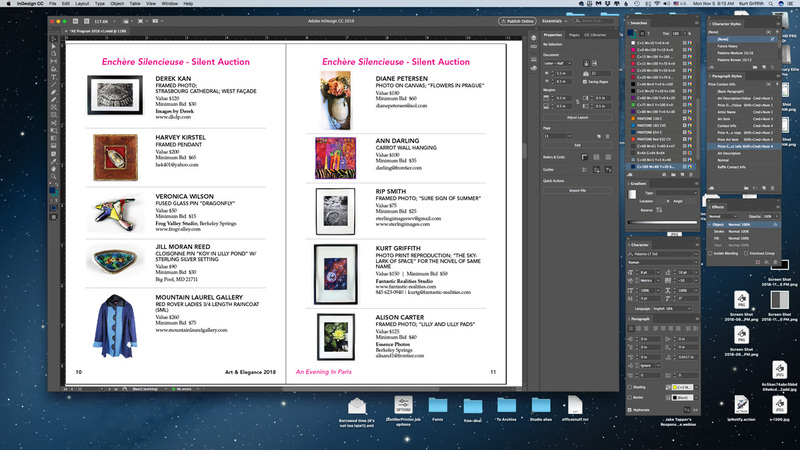 Screen shot of the AE 2018 Program in progress in Adobe Indesign. One of the high points of the event, and often a treasured keepsake is the Art and Elegance Event Program. The central feature of the program is the Raffle, Auction and Prize catalog – featuring all of the amazing Artwork and fabulous Experience Prizes donated by regional artists and local businesses. A tired A&E Committee – hard at work. 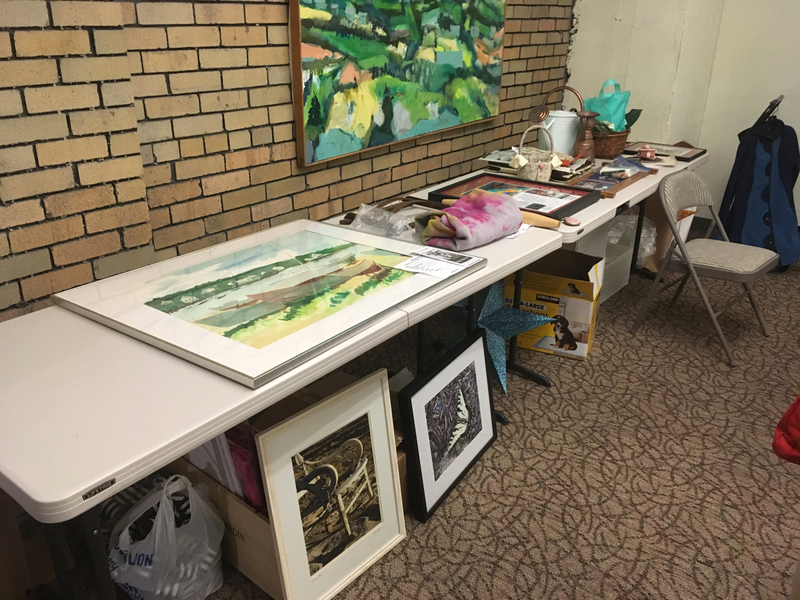 We’ve just finished cataloging the haul, and finished Art and Prize photography this past Thursday, and the committee took on the finicky work of assigning Art and Prizes to the Raffle, Silent Auction and our “Pop” Art Balloon Prizes. Captive graphic designer (and webmaster) Kurt Griffith has been squirreling away over the weekend putting the Program and Catalog together to get it to press in time for the event on Saturday. Adobe Indesign – a truly professional tool – makes it easier to pull together, but there are 1001 details to hunt down, verify, and proof, but it’s almost ready to go. We also have to compose ads, touch-up lists, gather acknowledgements, and all the things. By necessity, this publication has to be pulled together at nearly the last possible second to get everything in. But the hard work and hustling has paid off brilliantly. This year we have an amazing “surprise” painting by Featured Artist Jonathan Heath for the live auction that we’re sure will surprise, delight, and even startle some of our patrons, and three very awesome Prime Raffle Items, incluing a delicious print of our stunning 2018 signature image. We have an additional 66 Items available in the Silent Auction, and still another 52 “Pop” Art Balloon Prizes. So we’re looking forward to a fun night of getting a lot of art out there! Once we get the Program out to press, and working around Kurt’s actual day job of being a Professional Designer, we’ll try to get the Catalog of Art and Prizes posted online here! Collecting the Art and Prizes for photography and cataloging at MAC. The Committee has been busy! Among all the other 1001 things, we’ve been collecting artwork and prizes. Over the past two weeks, we’ve been photographing and cataloging the wonderful stuff people have been donating to this year’s event. 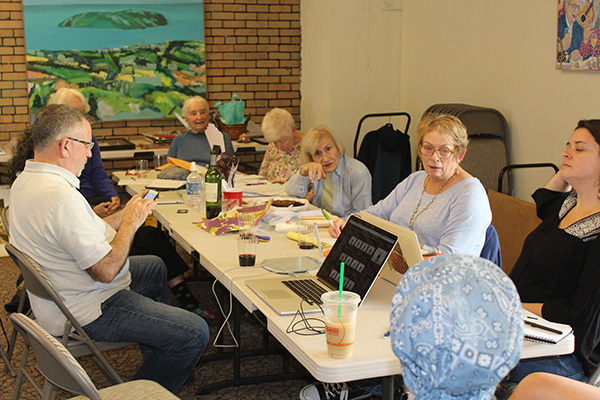 Among the tasks for the “jury” is deciding what will be Raffles, go into the Silent Auction, or become delightful Art & Experience Prizes. We also have a couple of nifty surprises that we can’t quite talk about yet. 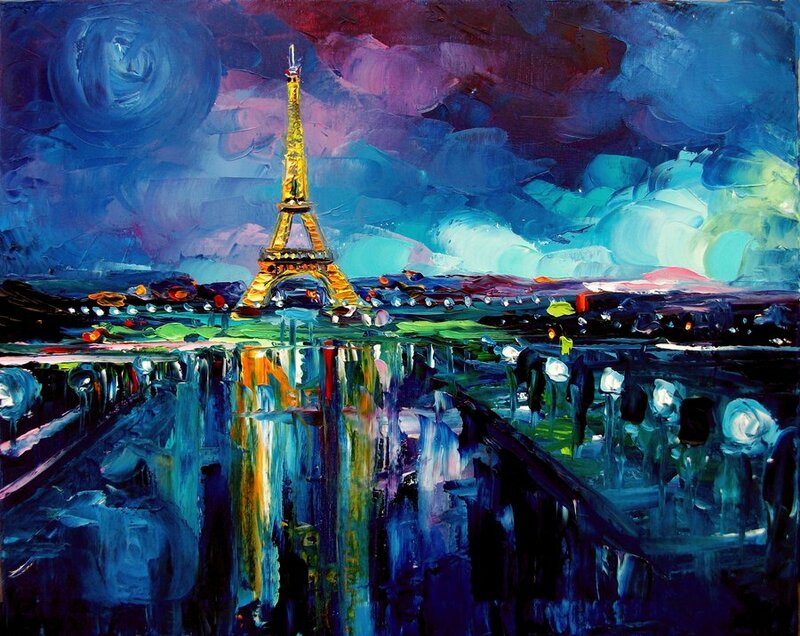 But we can say that it’s very fun, very Paris, and very Berkley Springs. But we can say that it involved this yea’s featured artist Jonathan Heath of Heath Studios. 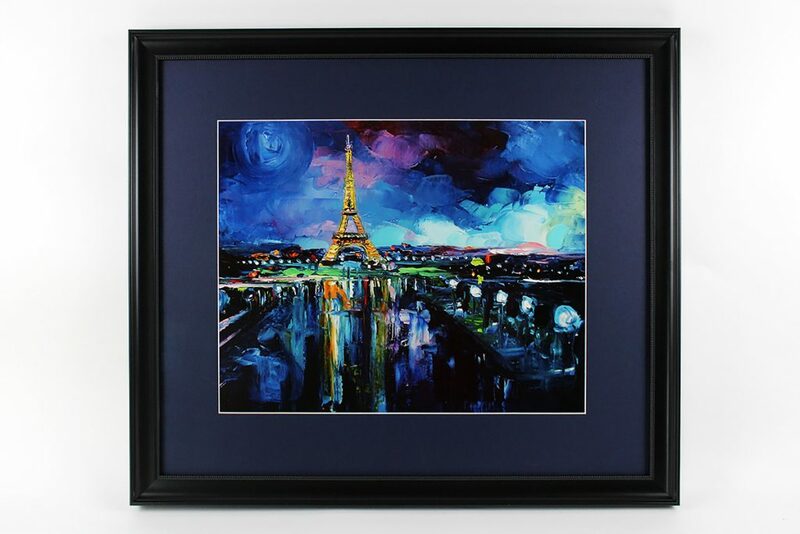 Parisian Night – 16×20 framed print by Aja Trier. However, we can talk about this. 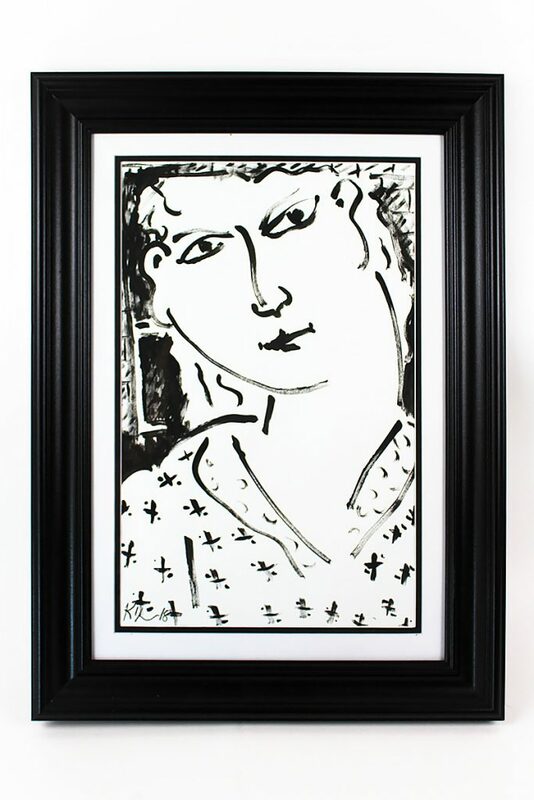 Just back from the framers is a gorgeous print of our signature image for 2018, Parisan Night by Aja Trier of Sagittarius Gallery in Scotia, NY. 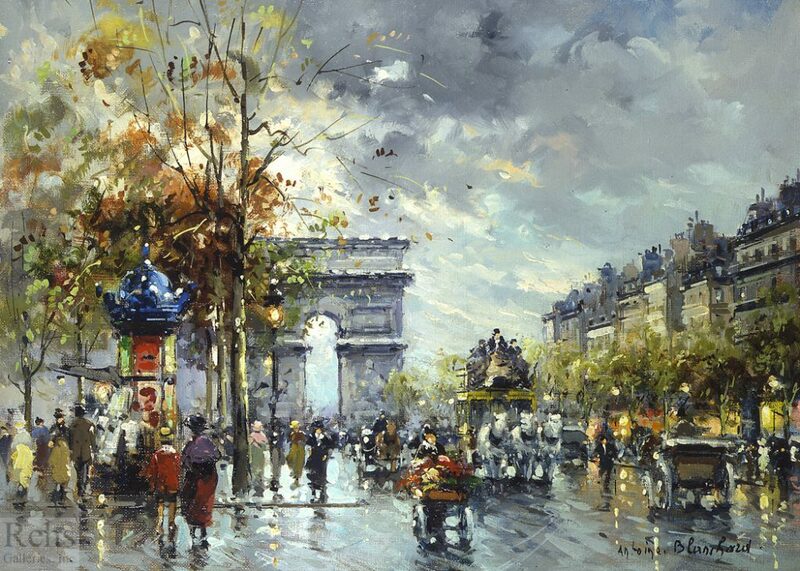 Much of her work is inspired by modern interpretations of quintessential impressionist Vincent Van Gogh. This lovely piece, will either be a raffle or silent auction item. It can be yours! We‘re hoping to post the entire collection of Art and Prizes online as we get everything catalogued! You can now purchase A&E Sponsorships Online as well as buy tickets using MAC’s secure PayPal service. If you have any questions about being an 2018 Art & Elegance Sponsor, please Contact Us! If you are unable to attend the event, please consider making a donation in support of MAC. When you donate $100 or more, you will be listed as a Patron in the event program! Thank you for your continued support- we look forward to seeing you for an evening you won’t soon forget! Make a Donation to MAC. For further information, or if you are interested in participating in this year’s event or helping out in any way, please Contact MAC Ice House at 304-258-2300. In is never too soon to bring us Artist Donations and Experience Prizes. We will, as always, have a need for volunteers to help the night of the event. We’re not ready to go public with all the details of this yet. But we’re up to something amusing, something nice for our guests at Art & Elegance 2018. Stay tuned! Check out the 2017 festivities at the Morgan Arts Council’s annual Art & Elegance fundraiser, The Jewell Ball – featuring the auctioning of a fabulous Ruby Necklace by local artist Abby Porter, fetchingly showcased by Middle Eastern Dancer Jensuya. November 11, 2018. Robert and Jenifer Peak created a fabulous video of the Extravaganza. If you weren’t there, check out what you’re missing! Art & Elegance 2018 – We’re Off! So save the date, and watch for changes and updates on here on the site, and on Facebook.